In the 1970’s a film genre was born that is often referred to as Blaxploitation. These films were originally made for an urban black audience but gained a wider appeal across racial lines. Blaxploitation films were the first to regularly feature soundtracks of funk and soul music as well as primarily black casts. Eventually someone got the bright idea of combining Blaxploitation and horror. 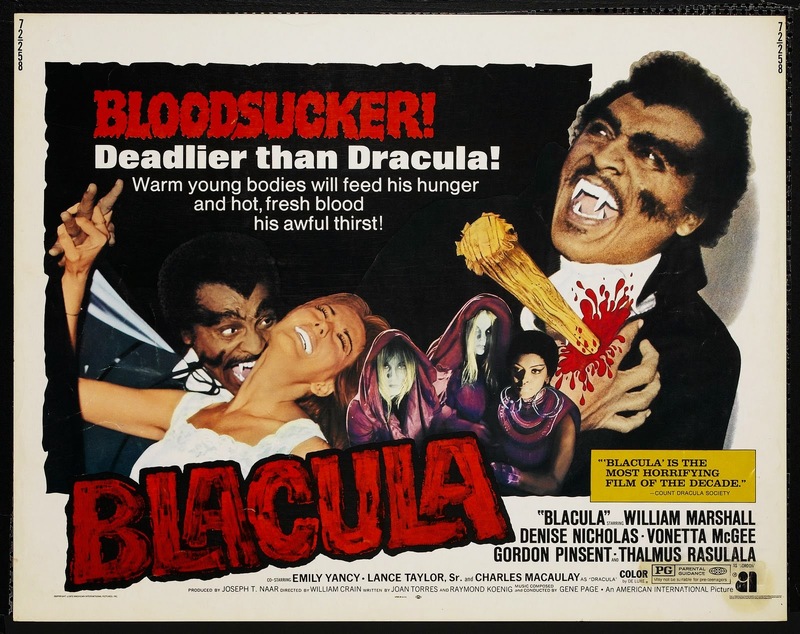 The result is Blacula as well as another favorite of mine Sugar Hill (1974) which is reviewed elsewhere on my blog. Set in Los Angeles, Mamuwalde arrives in America after two way-too-stereotypical gay antiques dealers buy Dracula’s estate including the coffin Mamuwalde resides in. When the coffin is opened the fun begins! Marshall is truly fantastic as Mamuwalde and gets everything right. He is supported by an equally strong cast including his love interest Tina, played elegantly by Vonetta McGee [Repo Man, The Eiger Sanction]. The other standout is Thalmus Rasulala [New Jack City, General Hospital] as Dr. Gordon Thomas. He is the perfect counterpoint to the bloodsucking Mamuwalde. This film was also the acting debut of Denise Nicholas who would go on to star in two hit TV series: Room 222 and In the Heat of the Night. Everyone is in the capable hands of director William Crain who went on to direct a number of episodes for TV shows such as The Mod Squad, Starksy and Hutch and The Dukes of Hazzard. Crain does a lot with the film’s modest budget of $500,00 and makes it feel like a much bigger movie. The Soundtrack is also slamming with tunes by The Hues Corporation [known for Rock the Boat], Gene Page and The 21st Century Ltd. The Hues Corporation also make an appearance in the film as the house band of a local night club. The only negative thing I can say about Blacula is that some of the other vampires are given a quick Halloween costume makeover for their parts instead of treating them to the wonderful detail found in Mamuwalde. I suspect this has to do with budgetary limitations but it’s the one thing that stand out as sub-par. Whatever you do, SEE THIS FILM. I also recommend watching Sugar Hill which will give you an inkling of what Blacula might have become if William Marshall had not been on board.